Two new Fellows have begun their work with the Sustainable Schools program, training for a year of engagement with District sustainability projects and teacher training programs. 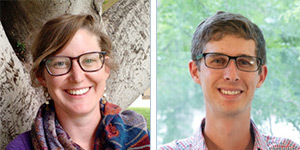 Molly Cashion and Nicholas Weller will be working with S4 leadership on the Paradise Valley Waste Stream Reduction Project which is entering into the second year of engagement with teaching teams on waste reduction activities, audits, and curriculum development. They will provide assistance for the Walton Sustainability Solutions Initiatives new National Sustainability Teachers’ Academy, starting with the first one-week professional development program held in Tempe, Arizona from June 22-26, 2015. Both fellows will also be available for outreach to valley schools, businesses and community groups in keeping with normal outreach activities of the program during this final year 7 of the NSF grant. No doubt, they will have a busy year keeping up with a growing list of K-12 sustainability education initiatives anchored within the Julie Ann Wrigley Global Institute of Sustainability.